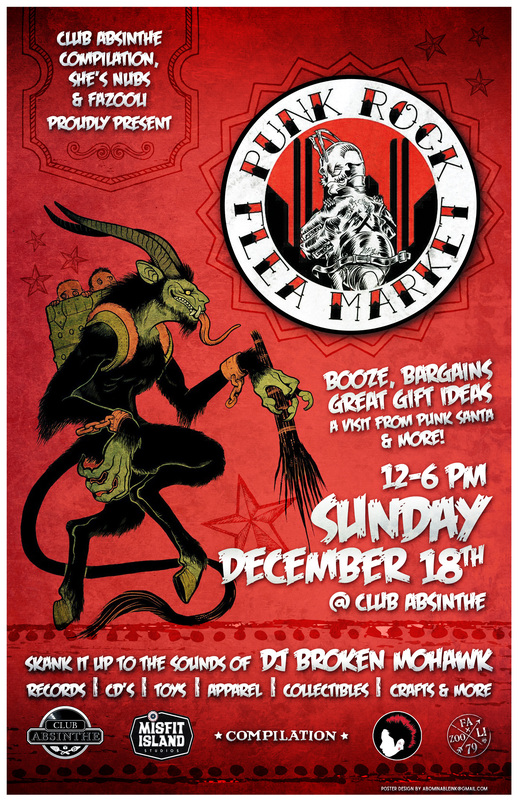 The Xmas Punk Rock Flea Market @ Club Absinthe – This Sunday! The Punk Rock Flea is Back! Call For Vendors – Apply Today! THE FUN STARTS TODAY! IT’S FINALLY HERE! Join us in one of our city’s cherished downtown locations with a hand-picked collection of some of Hamilton’s popular & up-and-coming Artists, Artisans & Craft Vendors, including great food, & music all under one roof! will all be there – you might have seen them around before, but come check out what they’ve been working on especially for this Supercrawl – gorgeous items to pamper yourself and spruce up your home by some truly wonderfully talented people! IT BEGINS! TODAY’S THE DAY WE KICK IT ALL OFF! Hand-picked Artists, Vendors and Craftspeople from around Hamilton and the surrounding Greater Toronto Area will be showcasing their talent and whimsical wares during Supercrawl on Friday, September 9th + Saturday, September 11th at Club Absinthe from 6pm until the bar closes in the wee hours alongside a stellar lineup of entertainment for your dancin party pleasure. will all be there – you might have seen them around before, but come check out what they’ve been working on especially for this Supercrawl! FRIDAY’S MUSICAL LINEUP includes the notoriously awesome BORN IN THE EIGHTIES, playing live – you’ll hear ALL YOUR FAVOURITE 80’s & 90’s COVERS and then some. Plus, we’ve also got the infamous DJ PARTY JESUS spinning, well, pretty much whatever he feels like – which is always totally rad. SATURDAY’S LINEUP includes more DJ PARTY JESUS – in case you didn’t get enough – he’ll be mixing it up all night! These AfterCrawl parties are ALWAYS a blast – although they happen after every Art Crawl (the 2nd Friday of every month), you won’t want to miss out on all the crazy wicked goodies in store for this big annual one, so lace up those kicks and come join us – Let’s Party, Champions! The Supercrawl ArtMarket @ The Hamilton Farmer’s Market – this weekend! THIS FRIDAY and SATURDAY @ SUPERCRAWL! I’ll be running a 2nd ArtMarket in the Hamilton Farmer’s Market that has a bit of a craftier vibe for all your home decor and personal accessory and product needs, right inside Sensational Samosa’s market area. There’s some AMAZING stuff to see at this one, as well as great tunes, the most incredibly DELICIOUS foods, and a great atmosphere for the whole family! Come check it out while you’re crawlin! This city is TEEMING with TALENT! Don’t miss a second of it! Supercrawl: The Artists Market @ AfterCrawl at Club Absinthe on Sept. 9th & 10th! Club Absinthe and Fazooli proudly present, in association with Supercrawl: The Artists Market @ AfterCrawl! 15 hand-picked Artists, Vendors and Craftspeople from around Hamilton and the surrounding Greater Toronto Area will be showcasing their talent and whimsical wares during Supercrawl on Friday, September 9th + Saturday, September 11th at Club Absinthe from 6pm until the bar closes in the wee hours alongside a stellar lineup of entertainment for your dancin party pleasure. FRIDAY’S MUSICAL LINEUP includes the notoriously awesome @bornintheeighties_ playing live – you’ll hear ALL YOUR FAVOURITE 80’s & 90’s COVERS and then some. Plus, we’ve also got the infamous DJ PARTY JESUS @jeffyboy spinning, well, pretty much whatever he feels like – which is always totally rad. SATURDAY’S LINEUP includes some cool DJs still to be announced, so STAY TUNED – we’ve got great things comin atcha! This Friday I’ll be setting up on James Street North for Art Crawl so look for me near the Armoury. After things die down on the street, I’ll be shifting my booth over to This Ain’t Hollywood for the Beats & Visions III AfterCrawl Party alongside a bunch of amazing Hamiltonians – be sure to come check us out! Beats & Visions events are all about incorporating the golden era of Breakbeats, House and Techno with live visual art. Headlining this year is DJ Marty Mcfly (top breakbeat DJ and original to the Canadian rave scene) with support from OSITO (Night Drive Saturdays, Jack and Lois Fridayz). Live painting by SANJAY B PATEL and KYLE TONKENS (currently showing at Mulberry Cafe). They’ll be creating rave inspired visuals on canvas. Custom dance-inspired Video Projections by LEE SKINNER (local music video director). Group Exhibit ft. local artists: JULIE FAZOOLI, DAN RIVERO, SANJAY B PATEL, and KYLE TONKENS.